Harworth Estates, one of the largest property and regeneration companies across the North of England and the Midlands, is set to be completely acquired by Coalfield Resources, the stock market-listed company created during a complex restructure of UK Coal. In an effort to "optimise the model for the business and drive growth for the benefit of all shareholders," a heads of terms agreement as now been reached to acquire the 75.1% of Harworth Estates Property Group Ltd held by the Board of the Pension Protection Fund, for £150m. 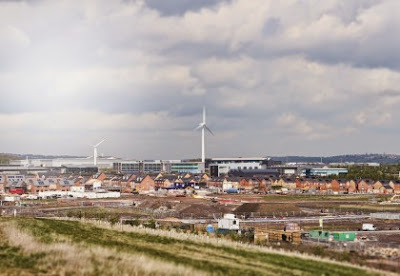 Harworth Estates, which is based on its flagship development at Waverley in Rotherham, manages around 31,370 acres across some 200 projects, with consent for 8,000 new homes. By regenerating former coalfields and brownfield land it valued its investment properties in June at £283.7m, up from £278.5m, and net assets at £247.3m, up from £234.7m. The deal is expected to be realised through cash raised by an equity offering of new ordinary shares in the first quarter of 2015 and by the Pension Fund holding between 25% and 29.9% of the share capital of the company. Following the successful completion of the acquisition, which is considered as a reverse takeover, the company intends to change its name to Harworth Estates Group plc. In a statement to the stock exchange, the group said: "Harworth Estates (HEL) continues to perform well and in line with management expectations. HEL continues to make progress across its portfolio of sites in terms of income generation, valuation growth and realisation through disposals. The property market in the regions in which HEL operates continues to show signs of improvement, and, as a result, Harworth Estates is seeing stronger demand across all of its activities." Jonson Cox, chairman of Coalfield Resources, said: "In the two years since our December 2012 solvent restructuring and separation from the mining businesses of UK Coal, we have made good progress in growing the asset value of HEL and delivering the management team's five year plan. The proposed transaction will give a strong platform from which to grow HEL as a developer of brownfield property and to realise value for all its stakeholders. We look forward to continuing to work with the Pension Protection Fund to deliver the transaction."